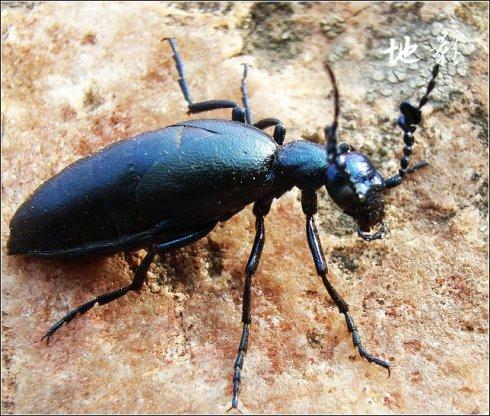 The drug is the dried whole body of Meloe coarctatus Motschulsky (family Meloidae) , imago living in grasslands near roadside, and distributed in Northeast China, North China. Pungent, slightly warm, extremely toxic; lung meridian entered. It is used to combat poisons, eliminate blood stasis and masses; for the treatment of scrofula, nasal polyp, mass formation in the abdomen, scabies, maligant sores, psoriasis, neurodermatitis. It is made into pills or powder for oral taking. Proper dosage is for external application, pounded into powder or soaked in vinegar or made into ointment for applying on the affected area. It is contraindicated to pregnant women and the weak. Be careful for oral administration.